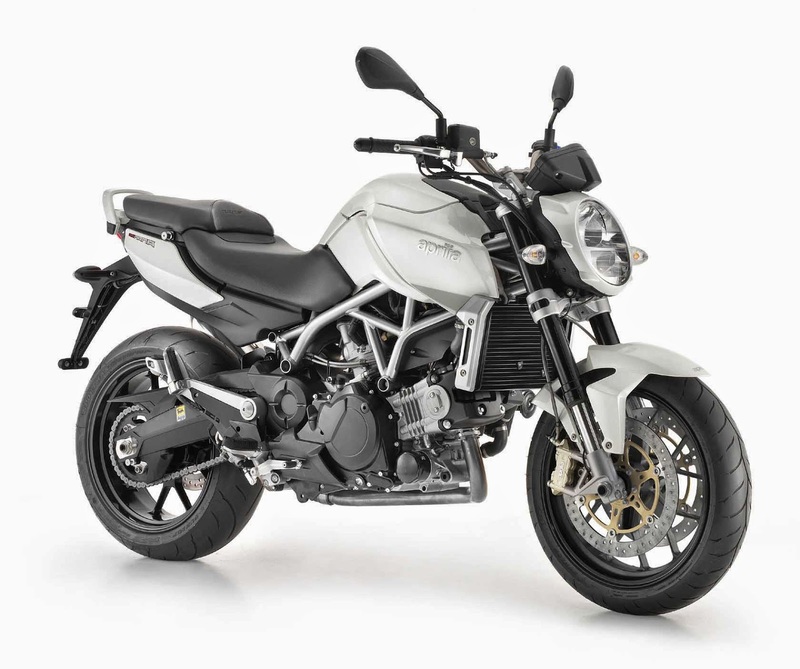 New Trends in Motorcycling – Automatics! It’s time for a major change in motorcycling. Really? How many times have you heard that one. It’s interesting – over the years, motorcycles have experienced some amazing technological advances – ABS, Traction Control, Ride-by-Wire, Active Suspensions…even specialized protective gear. All of these technologies are aimed at providing extra safety for our riding pleasure. They’re all good. But what technologies and inventions have you seen that make biking easier? Well, you might say, today’s advanced bikes are better balanced than yesteryear’s – and you’d be right. But I really mean ‘easier’. - Easier to learn to ride, easier to ride, easier to cruise. - Easier for novices and aged drivers alike. - Easier for those who have never used a clutch. - Easier for those who’ve never been exposed to the bare-bones riding elements, as we have. Ergonomically? With changes in hand controls, brakes, electronic ride controls? Nothing. Oh, wait a minute! Everything!! Some manufacturers have made shiftless bikes – automatic or shift-free bikes using CVT transmissions. Great news! And how have Canadians fared in this area? Horribly. I wonder why. To start with, Canadians are getting older… here are some facts: 1 in 5 Canadians are now aged 65+, and by 2013, that will be 1 in 4*1. In fact, back in 2012, 21 per cent of Canadians were over the age of 60. By 2030, that proportion is projected to rise to about 28.5 per cent, and by 2050, 31 per cent — nearly a third of all Canadians*2. When these seniors want to continue motorcycling (with arthritis), it’s only a matter of time until their hands and feet find shifting tougher and tougher. Here’s another example, having nothing to do with age - You want to ride with your friend or spouse or mistress (good for you! ), but he or she doesn’t want to learn how to use a clutch. Do you just give up, or get your friend or partner a scooter? Well, you’ve seen my articles on next-gen scooters and how great they are, that’s one way to go. But, some bikers only want motorcycles – and who can blame them for all they offer? So, if you chose motorcycles, you now have 2 choices - ‘automatic’ (gas) motorcycles, or electric ones. Automatic motorcycles aren’t new. Honda had introduced them some years ago, but because the bike was expensive and improperly weighted, it wasn’t a runaway success. Either was the Aprilia Mana, or the Ridley Auto-Glide. That’s too bad, as that early lack of success ruined the path for Honda’s revolutionary CTX-700N DCT model in Canada. Automatic motorcycles look, handle, and are as powerful as the motorcycles we’ve been used to. But when it comes to shifting, they use a CVT-like transmission, allowing the rider to concentrate on other biking essentials, such as balance, monitoring traffic and road conditions. Only upon very close inspection would anyone realize your motorcycle is shift-less. So, what choices do you have if you want an ‘automatic’ motorcycle in Canada? Well, this is where the short-sightedness of various manufacturers has let us down. It’s not news that Canada poses an issue to vehicle manufacturers – because of our unique vehicle regulations and inordinate taxes, we often get the dregs of their vehicles. For instance, I had a MazdaSpeed 3 (great car!) and I didn’t get anywhere close to the interior goodies that Americans got - for a far higher price. The same principle applies to motorcycles. So, that’s one reason why we don’t get the same varied bike selection as our fellow Americans. The other reason is Canadian marketers – far fewer vehicles are sold in Canada, so analytically obsessed marketers must be sure those sales will occur. As a result, while American Honda dealers are seeing resurgence in DCT automatic motorcycle sales, we don’t even get the choice of being able to buy one. You can always buy one in the U.S. (this is OK with Transport Canada’s rulings), but you’d need to check with Honda Canada if you can transfer warranty. Regardless, you’ll pay a fortune in extra taxes & transportation. 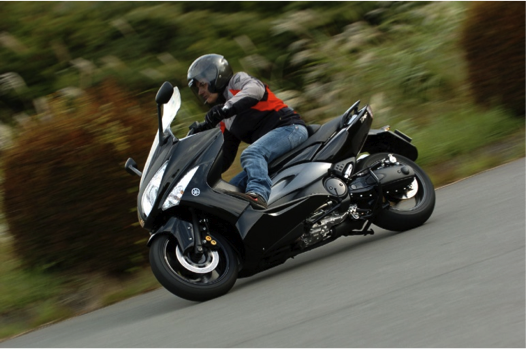 Back to Honda – they’re way ahead of the crowd with the CTX-700N DCT. The ½ Honda Fit power-plant’s low-slung’s centre of gravity makes riding and balancing this bike easy, especially for beginners. All controls are within easy reach and quite ergonomic – sit on one and you’ll know what I mean. Its suspension is competent; its street manners are near-perfect. By no stretch of the imagination is this a street rocket, but it’s not meant to be. Pricing is within just about every biker’s reach. This is a thoroughly modern bike line, so kudos goes out to Honda for their foresight. But… we Canadians don’t get to celebrate. 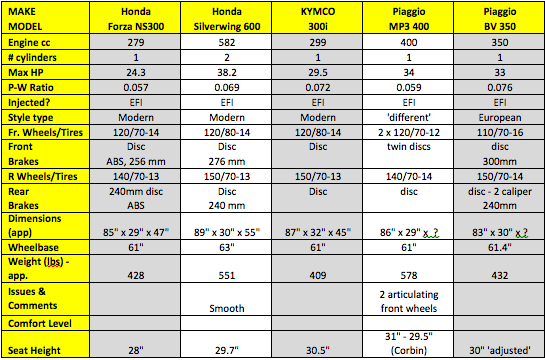 And Honda wonders why the standard (ie shift) models in Canada are selling fine, but not wildly! Honda – you came so close – but no cigar for your Canadian market managers. Suzuki used to have an automatic model, the 1982 model 450, but discontinued that a long time ago, and Honda had a 2-speed model also – they were way too early for the world to embrace them. The other well-known Japanese manufacturers (Kawasaki, Yamaha) have shown little interest in getting to this market area, but if they watch the world markets, they should. Now, onto electric bikes. 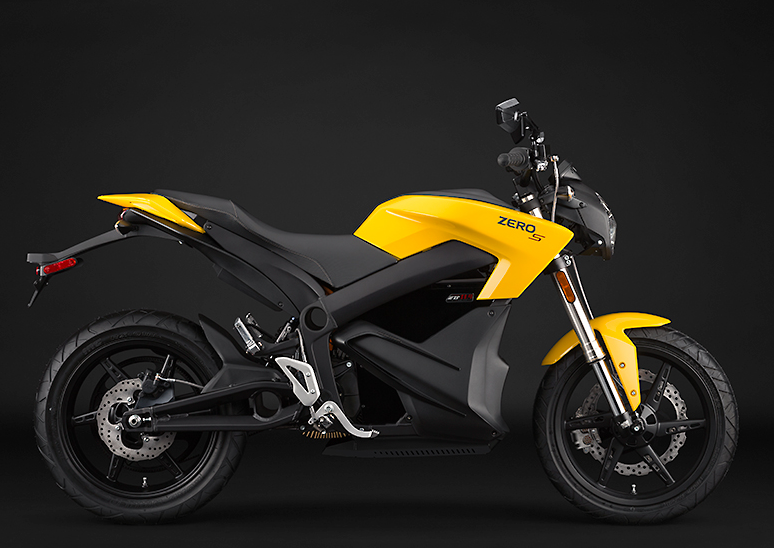 Yup, you’re going to pay a premium for ‘going green’, but you have a few choices – Brammo or Zero. These belong more to the crotch-rockets than cruiser type, but they can still do the job. Watch out for any range-anxiety long-distance trips, but for cruising around your neighborhoods, they’re quick, effortlessly powerful, and…wait for it… ridiculously quiet. In a way, they’re safer than any other type of bike, as you can literally hear all the traffic around you. The problem is – they can’t hear you. So, now you have a dilemma, in deciding if you want a Harley-type noise-maker rattling your brain, or a quiet-as-a-green-forest glider that those 4-wheeler drivers can’t hear. 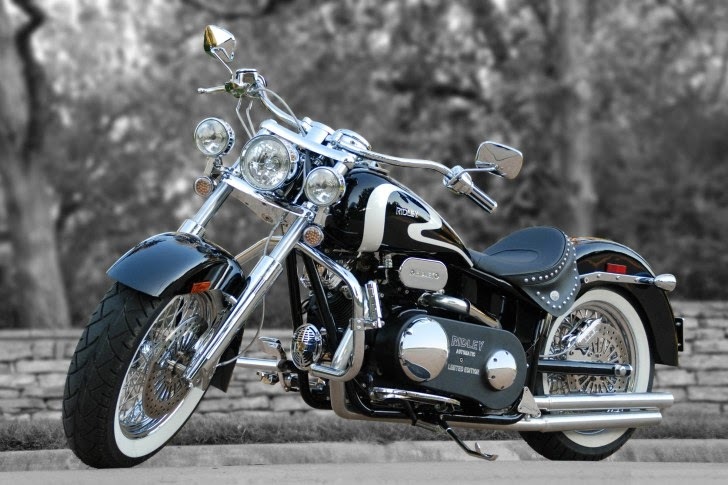 The unfortunate part of this decision is that you’re not looking at any high-volume motorcycle manufacturer, nor are you looking at any firm with head offices in Canada – so getting parts will probably be lengthier and pricier than normal. But, they’re electric, clean, reliable, and … so cool! These 2-wheeled versions of Teslas will attract any crowd – they may be the ultimate ‘pick-up’ bikes! Again, Canadians lose out, unless you find that the ‘electrics’ are becoming more prevalent and well-supported closer to home. When was the last time you saw one on the streets? Regardless of your choice, every motorcycle maker should be trying to increase their market breadth and reach, and realizing world demographics and aging and those growing wants and needs, going automatic is the fastest way. Hopefully, they’re listening, for both their financial rewards, and our biking enjoyment into our golden years. In Canada. Written by: Stephen Sacks, MBA, P. Eng. - Stephen started motorcycling in 1968. When he's not riding he leads a Telecom Marketing Consulting firm. He lives in the country so he can enjoy motorcycling, bicycling, canoeing, kayaking, and powerboating. When we last met, we discussed the maturing of maxi-scooters – the latest generation is action packed and every bit as fast, fun & comfortable as today’s motorcycle cruisers and sport-bikes. What’s important to you? Raw acceleration or top speed, cruising comfort or city prowess, highway weight or lightweight agility, European or Modern styling. Let me put all this in perspective, and then you’ll be able to sort, separate and prioritize – and it’ll all become crystal clear. 1. Intended Usage: City, Highway or both? More often than not, scooterists want a vehicle that will be equally at home in the city and on the highway. Well, guess what, folks? You can’t have a machine that is as agile in the city as it is graceful on the highway – those capabilities represent different physical qualities. For a machine to be nimble in the city, it needs a short wheelbase and a lightweight chassis. For it to be at ease on highways, it needs hefty weight, as well as a long wheelbase. The trick? Look for a machine that is compromised close to what your best guesstimate will be for your ratio of highway to city driving. For example, if you think you’ll have a 75-25% of highway to city usage, go for a maxi-scooter with a long wheelbase and reasonable weight, such as a BMW C650 or a Yamaha T-Max or Majesty. 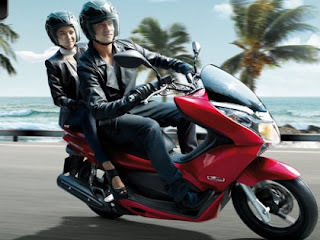 For the opposite, a 25-75% usage, go for a shorter-than-normal wheelbase scooter that tends more on the lighter side, such as a Kymco 300i Downtown or a Honda PCX150. Of course, these machines can also take highway use, but are aimed more towards city-going. 2. Performance Quotient: Are you power-hungry, with a love for blazing acceleration, or do you tend to like highway cruising, for its steady-state level of serenity? Choose wisely – and remember that we live in a country dominated by police forces. None of us want a get-me-to-jail trip, and many maxi-scoots will do just that if you’re not watching that speedo like a hawk. So, that lightning-quick maxi-scoot that’ll do 0-100 kmh in 4 seconds may cost you more than you think. Also, remember that torque is what gets you to speed fastest, but it’s HP that keeps you there. So, examine the power-band of each engine with regards to both HP and torque (not just HP) and be cognizant of where in that band you’ll get maximum torque. A vehicle that has gobs of torque but only at high rpm does you little good if you want acceleration and you’re not close to the stated rpm, and ditto that for HP. And this can get tricky – most manufacturers do state where in the power band you maximize HP and torque, but few state the curve or flatness of the power peaks. Watch out – if you know you’ll use this machine on the highways and it’s geared for mainly city use, your need for power may not match the power band curve of the bike and you’ll end up unhappy. Pay close attention to this one. You’ll see me compare Power-to-Weight ratios of many scooters; and while that’s good information, it certainly doesn’t tell the whole story. Beyond question, the best way to figure out if a bike has the power that you want, where you want it, is to take it for a spin, in the riding regime of your choice (city or highway). 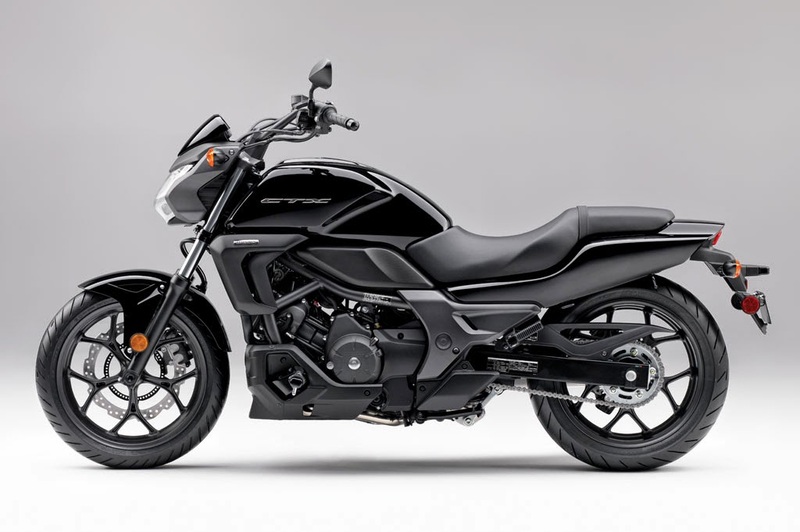 For example, for highway use, you may find that for your needs, a Suzuki Burgman 400 may do the trick on highways, versus a larger Honda Silverwing 600…it’s all how it feels to you. You’ll note that I’ve mostly left the Comments section open for you to fill in, and have left the Comfort Level line totally open for your thoughts in that area. Also note that seat and riding comfort is a combination of seta height, vehicle weight, wheelbase and steering feel, so it’s not just one of these details that will determine your personal comfort level. I can’t get all the maxi-scooters available here (there are more from BMW, Peugeot, Piaggio/Vespa, Kymco…etc., but this chart shows the most popular scoots around. 3. 1 or 2 up? My bet is that if you opted for raw performance, this is a non-question. By the same token, if you opted for cruising, there’s probably a good chance you’ll want to ride 2-up. The corollary here is obvious: what percentage of your riding time do you intend to ride with your partner? Like motorcycles, there can be a huge difference in driving experience and feel when you’re alone, or with someone. Overall vehicular weight changes, of course, but so does the overall center of gravity and center of roll, for a totally different feeling of stability. Even aerodynamics will be slightly altered, as well as fuel consumption, so be aware. Be aware, too, that if you intend to do most riding with another person, you should lean towards a higher power-to-weight ratio than otherwise. The last thing you want is to have insufficient power to climb hills and accelerate well on a highway. Scooters have been around for years, and populate Europe and Asia-Pacific markets. It’s not unusual to see a scooter in Europe with 80,000 kms on it! Those machines are styled for those markets – even some of the latest European-styled scooters look somewhat vintage and retro. European max-scooters feature very upright seating, straight-arm steering and large seats. Oftentimes, you’ll see no hump between the drivers’ legs (ie a straight-through design that doesn’t require a leg to be lifted over to the other side to get on the seat). Many European drivers actually use this area, very ingeniously at times, for storage, such as groceries. The European look is unmistakable, and is cherished by some, and hated by others. This is also the look that many Taiwanese, Chinese and Korean scooters have adopted. Modern-styled maxi-scooters, on the other hand, have aerodynamic front fairings for maximum weather protection, usually with an integrated windshield, and oftentimes a frame/hump between the legs. They resemble ultra-streamlined motorcycles, and have cutting-edge futuristic shapes. This Modern (mainly Japanese, but oftentimes of European manufacture also) look is unmistakable as well, and often features a more relaxed seating position than their European counterparts. Just pick whatever styling fits your taste – there is no right or wrong here. b. The ‘fit’ quotient: Here, there IS a right or wrong! It’s obvious that proper fit will lead to higher vehicle satisfaction, but some aspects of finding the right fit aren’t obvious at all. For instance, seat height is very important and just about always shown by manufacturers. You figure out your inseam, and go from there with a seat height that is less than or equal to that dimension. What you don’t often hear about is seat width, and that measure tells all about your legs being able to straddle the bike comfortably (or not). While you can buy aftermarket seats from Corbin or Shad that can sometimes lower the scooter seat height, they aren’t always able to reduce seat width. 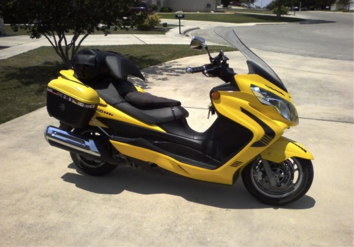 I had a Yamaha T-Max that was just a bit tall for me, but it was way too wide for me at the mid-seat area, and I ended up selling the bike to move to more comfort and ease of riding (but I do miss the T-Max’s incredible performance!). Weight and balance is also of vital importance. Many European maxi-scooters are weighted a bit higher up the chassis than their Japanese counterparts. For riders used to this, there’s no problem. For others, this weight higher up could make some riders ill at ease with their bikes. Once again, a long test ride should tell you if a bike feels right or not. 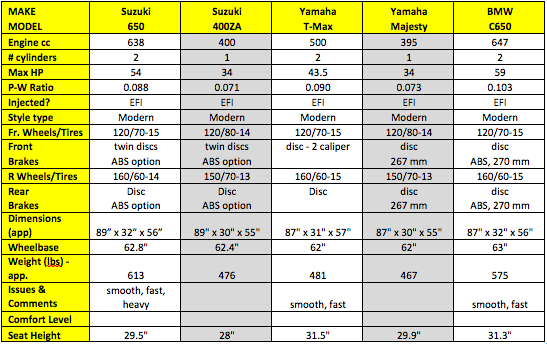 You’ll note that the 400-650cc bikes weight a lot more than the 300cc offerings – so if you’re uncomfortable with the extra weight of the larger machines, stick to the smaller ones. To garner a feeling of how each bike feels to you, start in the showroom: take the bike off (both) stands and sit on it. Can you flat-foot with both feet? If not, and you’re on your tip-toes, you can still ride that scooter, but you may not feel comfortable when you hit some undulating hills and have even less foot control once you park. Rock the bike from side to side – does it feel comfortable to do so? Walk it forwards and backwards – can you do that with ease? Turn the wheel and again walk forward – does the scooter feel secure to you, or is its weight and wheelbase starting to feel uncomfortable? Take your time here, as this is an iterative, trial-and-error choosing process, so let the salesman give you some time to feel out each bike. This is where the vehicle will feel too large or small, heavy or light, or just right…so pay close attention. If you do plan on riding 2-up, ask the salesman if the rear suspension is adjustable and has preloads. If it does, you know that the manufacturer has added features that are well thought out for 2 riders, and this is an example of foresight on their part. A suitable example is the Piaggio BV 350, which has a variety of preload adjustment to the rear suspension. Another part of the ‘fit’ quotient is your desired comfort level. Check out your intended scooter on the highway, and feel any wind buffeting, cross-wind effects, suspension travel over bumps, power at various speeds, mirror placement, braking feel, and general handling during corners. You may be surprised at the differences you can feel on various maxi-scooters at 100kmh when a tractor-trailer flies past you on the opposing traffic lane. When you return the bike, check something that seems to always be forgotten – how easily can you get the bike on its centre-stand? Put it all together, and then you can understand what level of refinement you really desire in your max-scoot. 5. Price Limitations: Why did I leave this question for last? Because I wanted to ensure you were picking the right machine for your needs, wants, and especially ‘fit’…and only now can we check on pricing, whether it be a new or used machine. Just like cars, you can pick a brand new scooter with all the bells and whistles and warranty, or you can hop onto AutoTrader.ca or kijiji.ca or visit many dealers and find good choices for pre-owned vehicles that have already depreciated. Watch out for the goodies you may want but may not need: ABS, traction control, radios, intercoms…the list goes on. Personally, I go for all the safety items and leave the radios, but again, each to their own taste. If you’re new to scootering, I highly suggest the latter as your first choice. After a while, you will hone in on what’s best for you, and then you can resell your used machine and go for a new machine with the styling, fit, finish and power you’ve yearned for. Read on…in our next session. “Keep those wheels on the road”. Check out Part I of this article: Maxi-Scooters = Maxi-Blast! There’s a lot going on when it comes to motorcycles in Canada. There are touring, sport, off-road and a million other categories. 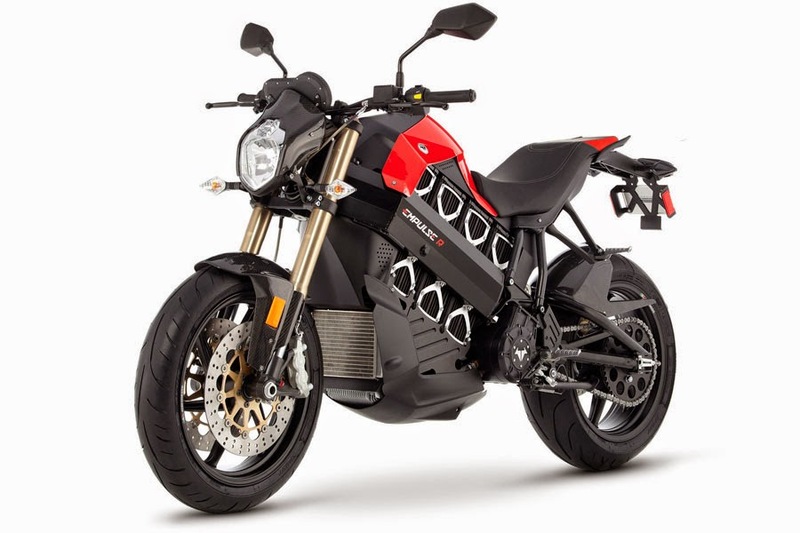 Motorcycles are all the rage, and with the latest addition of safety and convenience features like ABS, energy-absorption chassis, embedded rear-view helmet mirrors, Bluetooth stereo intercoms, and more, who wouldn’t want a motorcycle? Today’s maxi-scooters, with anywhere from 300 to 850cc, will keep up to any touring bike or cruiser, with at least their level of comfort. But, the scooter’s CVT transmission means the driver doesn’t need to shift, as motorcyclists do. That may not seem like an issue (“hey, I’ve shifted for years and years and it’s second nature to me”), but in a drag race, the similar displacement scooter will beat the motorcycle every day of the week – with not a millisecond wasted on shifting! What about their mileage? Really, are you thinking of gas mileage when you ride, or choose your ride? Probably not. But, in any case, maxi-scooters will again get you at least as far on a litre of gas as any motorcycle. So, there’s no problem there, either. Maxi-scooters are even beginning to look like sport-bikes. I’m not referring to those vintage looking Vespas, no. Take a look at the new breed of scoots: Yamaha’s T-Max, Honda’s Forza, BMW’s C650, Kymco’s 300i, and you’ll see what I mean. You can do 1,000 kilometers on these ‘bikes’ without creasing your jeans! 1./ CANADIAN ‘MARKETERS’: Maxi-scooters are in just about every country of the world, whether 1st or 2nd or 10th world countries. They’re efficient, fun, fast, sporty, and amazingly reliable and convenient. In many countries, these machines are peoples’ only mode of transport. And ‘almost’ every country gets the latest and greatest models – except Canada. In every sense, we’re the equivalent of a European country, where you can buy the best of the best from Italy, Japan, Taiwan, or France. Yet Italy’s Piaggio chooses to bring in very few of its latest gen max-scooters. Instead of bringing in their world-beating X10-350, they brought in their BV-350. Other than styling and name, it’s a great bike, but would you ride a bike called ‘the Beverley’? I didn’t think so. It comes down to being lumped in with the States, and they too, haven’t received the latest generations of these great machine from around the world. We do have the market - witness that Chrysler/FIAT’s 500 sales in Canada blew the doors off their U.S sales counterparts! So, it ends up being the marketing departments that just don’t see clearly. Yup, it’s as simple as that… marketers missing their mark and sand-bagging their sales targets. 2./ PREJUDICE: Try out a maxi-scooter. Wait – you want me to drive one? SURE. Give it a go and you’ll see what I mean. And no, you don’t need to be Italian to ride one. (“Two men ride into a car wash; which one is Italian? The one on the scooter”). 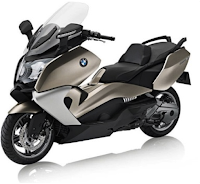 When motorcycle journalists tried the previously-mentioned Piaggio BV-350, they commented that “roll-on and mid-range acceleration should be reviewd by the FDA as a drug…. 33 horses and torque to match under 400 pounds means giggling-fun acceleration”. Yup, it’ll keep up to a cruiser, maybe even a similar-cc sport-bike. Twist that throttle, and you’re gone! No lag, no shifts, now waiting…. Just right-now, effortless acceleration! What a blast! Try this on a more powerful scooter, like the T-Max or the BMW, and the acceleration gets even better. This is max-adrenaline on a maxi-scoot! I have a Can-Am Spyder and a max-scooter, and while the raw power of the Can-Am suggests it will out-accelerate the scoot, that’s never been the case. Give it a head-to-head ride comparison: yup, take the challenge. When it comes to your next bike, before you plunk down the bills for that cruiser, take it out for a ride. Now, look at a T-Max or Majesty or BMW or others, and take one or more of them out for a ride. Which ride was more fun with the higher level of comfort and satisfaction? You may choose the motorcycle or the maxi-scooter, but at least now you’ll know when you see that scoot pass you on your next highway trip, why you made the decision you made. So, if we can get these manufacturers (just about all of them) to get off their butts and actually check out Canadian pent-up demand, you can get the chance to actually try one of the latest gems out. Will you be shocked! Keep those wheels on the road.